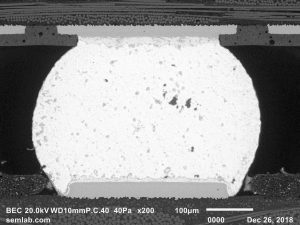 BGA Solder Joint Microsection - SEM Lab Inc.
BGA solder joint microsections are useful for evaluating microstructure, interfacial intermetallic layer thickness, voids, and other conditions. The example below shows a nominal BGA solder joint on 0.8 mm pitch. In addition, the geometry of the solder joint can provide useful data such as deviation from the nominal condition and the magnitude of residual warpage. 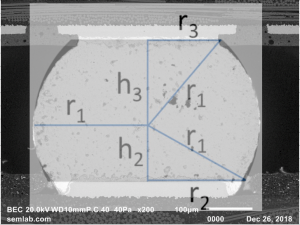 In summary, there is much to be learned from BGA solder joint microsections.